Most know the Mississippi River as the powerful, coffee-colored waterway that cuts through the center of America, or as the stomping grounds for Mark Twain's indelible characters. Many locals know it as a body of water to stay clear of; every year several people who underestimate the strength of the River drown in its undertow. Few know it as wilderness. Wilderness for many means jagged mountains, evergreen forests, and rock-bottomed streams with clear, cold water. Not a muddy, stump filled channel conveying barges through the belly of the country. Described by many as the John Muir of the Lower Mississippi, John Ruskey has arguably done more than any other person to demonstrate that a wilderness worthy of America's highest conservation ideals exists right under our noses in the flowing form of the mighty Mississippi. John graciously allowed me to include his writings in my recently-published wilderness anthology, I AM COYOTE: Readings for the Wild. Here's how he describes the wilderness of the Big River. The origins of these waters are found upstream in America's Heartland, St. Louis, where the Upper Mississippi confluences with the Missouri to form the Middle Mississippi. The Middle Miss separates the Pawnee Hills from the Ozarks and then meets the green waters of the Ohio at the southern tip of Illinois to form the Lower Miss. You can trace the curvy blue line of the Lower Miss southward, deep into the gut of America, the Deep South, down to the Gulf Coast. 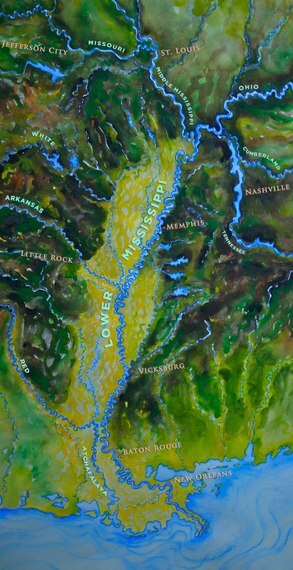 The valley of the Lower Miss was once an inlet of the Gulf of Mexico, then a glacial floodplain, and later a thriving jungle of 22 million acres. Even though it's been settled for more than 100 years, its forests cut, its back channels plugged and main channel vigorously maintained, the river still rules the landscape with unimaginable power, annually rising and falling fifty vertical feet with fluctuations of millions of cubic feet per second, preparing the stage for an unlikely setting in wilderness travel. The wonderful, surprising thing about the Lower Miss is that it's still wild. Paddlers see some industry and agriculture between Cairo and Baton Rouge, but for the most part the experience is of big water, big forests, big sandbars, big bluffs and big skies. Does this sound like Alaska? Or Lake Superior? Or Puget Sound? Yes -- but it's not. It's nothing but the biggest river in North America, and the longest stretch of free-flowing waters in the Lower 48. There are 105 Wild Miles on the Middle Miss between St. Louis and Cairo, Illinois, and 515 Wild Miles on the Lower Miss between Cairo and Baton Rouge. Wild Miles are the places along the river where nature predominates, and nothing is seen of mankind save passing tows and maybe a tiny hunting camp or a single fisherman buzzing by in a johnboat. These are places where the landscape is filled with giant islands bounded by endless mud banks and sandbars, where the river is overseen by big skies and where the sun sets uninterrupted by buildings or wires. These are places where the big river emanates its creative, wild beauty. Each high water results in shifting sand dunes and re-made sandbars. These are places where only deer and coyote tracks are seen along the sandbars and enormous flocks of shy birds like the white pelican and double breasted cormorant are comfortable enough to make landing for the night. Once-endangered species like the interior least tern and pallid sturgeon have regained a foothold in this fecund landscape. These are places where it's dark and quiet at night, where the stars fill the skies like brightly shining jewels poured out on a dark purple velvet blanket. America has an opportunity to find the "wilderness within" by recognizing and preserving its remaining wild places. Few locations are more deserving of recognition and preservation than the gigantic floodplain of the Mississippi. This floodplain has been preserved mostly by neglect, by the power of the river, by its catastrophic rises and falls, and the danger of building anything nearby. Recent flood cycles and declining populations of the lower floodplain make it one of the best places to restore native bottomland hardwood forests, and re-open back channels with notches in the old dikes. Restoring forests in the floodplain creates habitat for wildlife, improves water quality, provides a flooding buffer, and helps reduce the Gulf of Mexico's "dead zone." 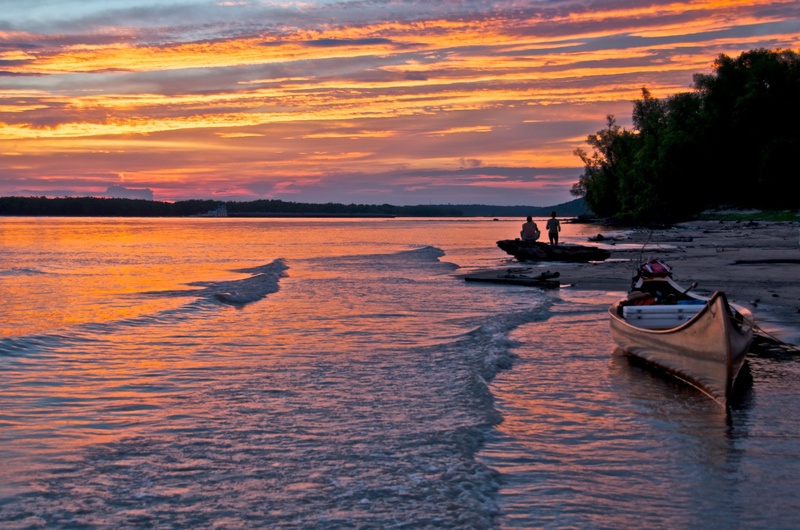 Join me and thousands of others in the effort to preserve our nation's Big River. Let's protect its ecosystems by leaving open areas like the New Madrid Birds Point Floodway. Most importantly, get outside and enjoy one of the great undiscovered wilderness areas running through the gut of America.